Yahoo unveiled a new app that combines video and text messaging, minus the sound. Livetext allows people to watch each other’s silent reactions while texting. Mute video texting gives Livetext a unique feature, differentiating themselves from Snapchat, WhatsApp, Facebook messenger, Skype, and Viber. They believe this app syncs the simplicity of texting with real-time reactions and emotions. the presence of audio can sometimes prevent people from responding to video chats right away, but they may still want to see one another while texting. Yahoo has combined all of the best features from messaging apps: Livetext displays text messages and emojis on the video screen like Twitter’s Periscope, doesn’t save or archive chats and media files like Snapchat, and organizes contact lists and friend requests like Snapchat too. Arizona Palliative Home Care started a new program within the Hospital “Hospice of the Valley.” The program takes care of seriously ill patients to improve their quality of life. 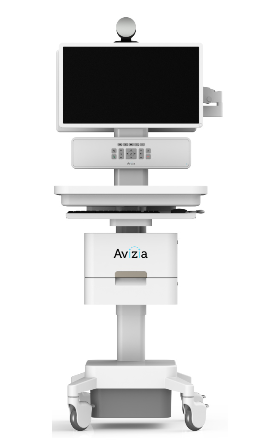 Going in and out of the hospital for these patients are both difficult and expensive..
Because of this, Arizona Palliative has utilized technology from Avizia, a telemedicine company with a video chat system for easy communication with doctors and patients. A lot of these patients have cancer or dementia, and they’re using the technology to talk to patients about next steps for treatment – whether they want to undergo chemo if it means living for four more months. The platform also includes organizational software. The software, called Workflow, is a virtual waiting room. A doctor on call gets a private text by the Workflow operator, and if the doctor doesn’t respond in five minutes, the patient goes to the next doctor on call. Before the company used the video chat feature, doctors would be able to see 3-4 patients a day, now they are seeing 6-8 patients, doubling their rate. Why it’s hot: We’ve seen video chatting already on the Walgreen App as well as Google chat, but a cart such as this could standardize talking with a doctor 24/7 around the world. People who are actually sick dread going to the doctor’s office. This could be seen as a solution to get people in and out quicker without even having to leave the house. Technology is ever-changing, and we’ve been seeing the trend of on-demand is taking over. Will we see the trend next at maybe the DMV? Sean Parker, founding Facebook president and billionaire investor, thinks that American democracy is flawed. He believes that population increases in the US has lead to citizens being largely unaware of political issues and that social media can address some of these concerns. “Democracy was not designed for a world where we have over 300 million people,” Parker told Mashable, referring to the U.S.’s current population of 322 million. “It was designed for 325,000 colonial white men. That’s where Brigade comes in. 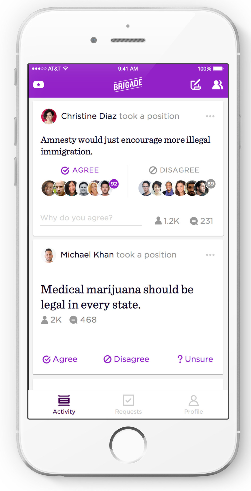 Brigade, which raised $9.5 million from Salesforce.com, is a social platform that features political issues where users can post (take a “position”), agree/disagree/unsure, and comment. The Reddit-like forum allows users to “Upvote” a post so it appears higher on the screen. The beta version of the app was released on June 17 to the app store and currently has a 4 and a half star rating. People post, share, comment political opinions on Facebook daily. Parker saw a need and created a forum for people to do just that. While some people share their political opinions on Facebook, I think that the majority of people stay away from oversharing. I think that this app will get people talking about issues that they care about without feeling shameful. With its launch last month, Pinterest’s “cinematic pins” allows marketers and brands to create short animated pins to make their ads come to life. The gif-like videos play only when the user scrolls. Wendy’s is taking advantage of the trend by becoming one of the first high-profile brands to release a Pinterest campaign that includes four cinematic pins. The campaign highlights its new Strawberry Fields salad and features a strawberry’s lifecycle from farm to plate. Why it’s hot : Wendy’s is taking a bold step to show brands they can use Pinterests’ cinematic pins even if they’re not immediately selling the product online. The brand created a unique ad to fit the platform that is sure to inspire others in the category.